Outdoor applications for TIVAR® UV Resistant are endless. The modified formula retains all the key properties of TIVAR® — low friction surface, wear and corrosion resistance, impact strength — and, exhibits enhanced stability for outdoor, UV-exposed applications. In agricultural applications, TIVAR® UV Resistant extends the life and performance of field equipment. Parts made from TIVAR® UV Resistant are self-lubricating and won't corrode or freeze, offering extended life and improved performance whether used on new machinery or as retrofits on weathered equipment. TIVAR® UV Resistant is available in black and custom colors, in 48" x 120" sheets with gauge sizes ranging from 1/16" to 2". 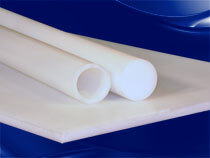 It is also available in rod, board, tape, tube and molded parts.